The mid-engine 2020 Chevy Corvette C8 is just around the corner, based on prototypes we've been seeing in mostly production-spec guise. As such, its racing counterpart, the Corvette C8.R is also just about ready. We've seen the race car a time or two before, but the video above, dug up by Jalopnik and posted by YouTube user Lanky Turtle, gives us our first listen to it. It's great, but not what we expected. As the Corvette laps the Sebring race track in Florida, it makes a high-pitched, urgent V8 noise we'd expect from, say, Ferrari — not Chevrolet. It's all the more curious when prototypes of the road car have the more traditional deep burble and rumble we would expect of a Corvette. There are a variety of things that could result in this radically different sounding engine. Two that come to mind first are the use of double overhead cams instead of pushrods to help it rev higher. Second would be the use of a flat-plane crankshaft, similar to that of the GT350, which would also help with getting the engine to rev higher, but also would change the exhaust note with cylinders firing at different times than in a traditional cross-plane crank engine. All of this naturally has us curious about the road-going C8. Surely there will be a traditional pushrod, cross-plane crank model available, since the prototypes we've seen don't sound especially strange. But perhaps there will also be a higher-performance engine offered with double-overhead cams and a flat-plane crank. There have been rumors that there would be two levels of engine offering, too, with the fancy DOHC engine getting a pair of turbochargers. The strongest evidence has come in the form of leaked CAD drawings showing a naturally aspirated engine, and one showing a twin-turbo engine. It would also be easy to think that the twin-turbo engine is a version of the 4.2-liter engine Cadillac planned for the CT6-V, but that engine has the turbos nestled between the cylinder banks, whereas the purported Corvette engine has the turbos on the outside of the heads. That and Cadillac's former boss said pretty plainly that the 4.2-liter V8 was just for Cadillac. 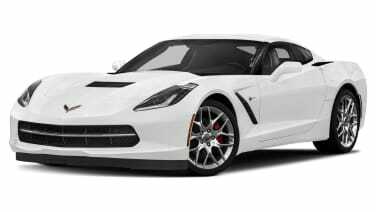 Regardless of the engine options, the mid-engine Corvette should be a thoroughly heart-pounding sports car. We shouldn't have to wait long to see it either, since, as we mentioned, relatively undisguised prototypes have been caught testing. Surely we'll see it by the end of next year, and probably sooner.